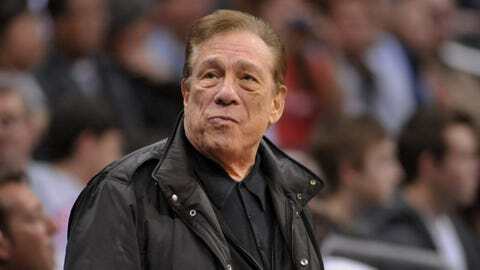 LOS ANGELES — When Clippers coach Doc Rivers broke the news to his players Tuesday — that team owner Donald Sterling had been given a lifetime ban by NBA commissioner Adam Silver — the reaction was dead silence. Perhaps it was more relief than anything, but the overall sense among Clippers players must have been that the decision they were seeking was the one they got. Rivers called it "fantastic." Warriors coach Mark Jackson said Silver did "an incredible job." 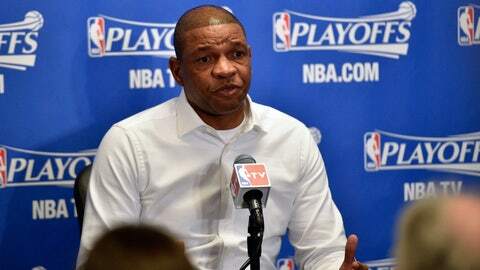 "He made a decision that was the right one, that had to be made," Rivers said before the Clippers and Warriors met at Staples Center for Game 5 of their best-of-seven series. "I don’t think this is something we rejoice in or anything like that. I told the players about the decision. I think they were just happy that it was a resolution and it’s over, at least the start of it." Clippers guard Chris Paul, who is president of the NBA players association, issued a statement that said: "In response to today’s ruling by the NBA and Commissioner Adam Silver, my teammates and I are in agreement with his decision. We appreciate the strong leadership from Commissioner Silver and he has our full support." Rivers said he believes the ruling will give his players a sense of freedom as they try to regain control of the series, which is tied 2-2. Sunday, they lost 118-97 and looked lethargic from the start. "The basketball part of it, we’ve prepared as best as you could," Rivers said. "Emotions drain energy. I know that. I felt that the other night, and when you watch it on tape, we were slow on everything. That’s because of all the emotions that have gone into this. "I think they’ve been able to breathe a little bit more over the last day and a half. I’m hoping they’re up for the task. I do think this will be a safe haven for us. I think our crowd will be amazing tonight, and I think that will help them." Rivers and Jackson said a player boycott was a possibility, at least until Silver’s press conference in which he fined Sterling $2.5 million and said he would be forced to sell the team after making alleged racist comments. "It was a real discussion among the players," Jackson said. "I think they were sitting, listening very closely, to the tone and the words that came out of the commissioner." Rivers said he didn’t believe his players would have refused to play, but he added, "They were waiting for a decision, and that clearly could have happened. That was one of the reasons I didn’t have practice yesterday in a clear practice situation. When you get blown out, you probably should have a practice. I just didn’t think it would make any sense to do it. I thought they needed to go home and be with their families and breathe a little bit." Asked when his players learned of Silver’s ban, Rivers said, "It was during a film session. In the middle of it, I just kind of said what happened and what Adam had said. Honestly, there was nothing in the room at that time. It was complete silence. I said what I thought I needed to tell them, and then we went right back to film." Asked what he told his players, he said, "That part will be private. A lot of it was just how much I admire them and how they tried to handle this, and to let them know there was some closure but there’s still work to do. I just thought they set a very good example around the league on how they conducted themselves." Rivers also said he has not decided whether to return as coach next season if the league has not moved toward finding new ownership. "I haven’t thought about it," he said. "I haven’t thought about leaving, staying, and the main reason is that this should not be about me and what I’m doing or want to do. I want to coach. I love coaching. I’ve enjoyed these guys. "We’re just going to let this whole thing run its course and then we’ll all have better clarity. I don’t want to be in a position where it sounds like I’m threatening anything. I want my players to be comfortable. I think that’s the most important thing. Let’s just see where it goes for them."